I was a young, teenage mom when I gave my life to God. I had completely gotten my life off track, but when I prayed that prayer of relinquishment I trusted that God could do something with my life. Boy, He didn’t disappoint. Over the years I’ve been involved in wonderful churches with dedicated believers. I’ve walked through life with a godly man, and I’ve done my best to encourage and inspire others … but looking back most of what I’ve learned about discovering God’s will for my life I’ve learned from some really powerful books. Below are six books that have transformed my life. They’ve helped me to focus on the most important things. They’ve helped me to set my eyes on eternity. They’ve guided me in discovering God’s will. All of these books are biblically based. And in the case of Joanna Weaver and Sally Clarkson, I know these women personally, and they truly live what they write about. In the other cases, I’ve watched these godly people for a long time, and they also live what they believe. It’s important to open our hearts to God’s Word. (Very!) It’s important to seek the wisdom of others, too … even if it’s in the pages of the book. I hope you take time to read one … read three … read all six! And when you do I want you to send me and note and tell me how their words have impacted you, too! Finally, take time to ponder the quotes I’ve selected. The key to discovering God’s will is taking time to think about God’s plans for this earth, for eternity, and His plans your place in both. What are a few books that have impacted your life? Share in the comment section for the chance to win a surprise set of books! — Rick Warren, The Purpose Driven Life What on Earth am I Here For? 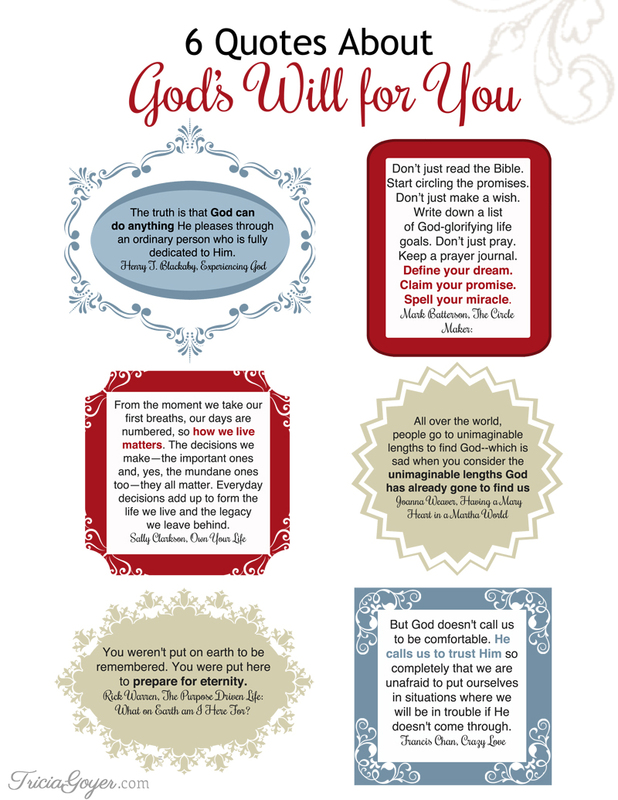 Download and print the 6 Quotes to About God’s Will for You printable! Tricia I have read 2 of these books. I recently finished Experiencing God and I was true my enriched by what I read in this book. The thing is to focus on God. I liked where it said to pray about something and then watch and wait. Especially while reading God’s word. The answer will come. Sure enough I did pray for an answer to something that was weighing on my heart. Not long after that I did read something in the Bible that was an answer to my prayer. This really works. Also I have read The Purpose Driven Life. I took a while with this book as Rick requires we read only one chapter a day. I made up a poster and put sticky notes on it each day about what impacted me the most about that chapter. That was in 2009. Both books are definitely keepers and should be read more than once. Bob Sorge’s THE FIRE OF DELAYED ANSWERS. This one has really helped me during the wilderness season. Tricia, my mom and dad said Experiencing God really impacted their lives too. It’s totally on my tbr list. Thanks for the other recommendations as well. 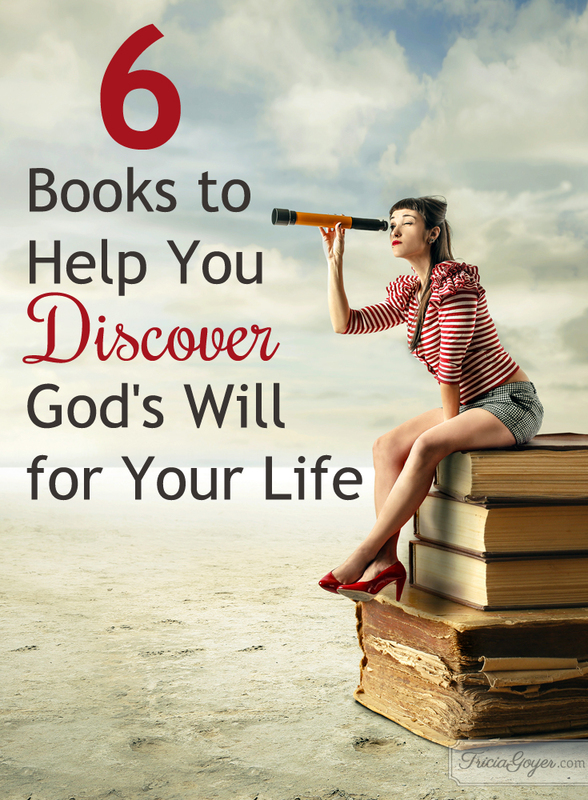 I’m always looking for new (at least to me) books that will help me dig deeper with God. Own Your Life, The Fitting Room, The Sweet Side of Suffering and books by Elizabeth George have all helped me in my Christian walk. Experiencing God and Crazy Love I’ve both read and studied. They have real impact for lives if you open yourselves up to be changed for the better. I have a church friend that belongs to Soroptimist Tuscaloosa. I found out recently that part of their ministry is to teenage mothers. I won your book Life Interrupted a few months ago and am going to donate it to her so that it can be used to help others. Thank you so much! There are some great books mentioned in this post! I’d say Margaret Feinberg’s The Organic God and Ann Voskamp’s One Thousand Gifts would be on my list of books that impacted me the most. The purpose driven life by Rick Warren was a big influence on me. It was part of a 3 year process of changing my life and my relationship with God. I read the Bible the first year, joined a Bible study the second year, and found a church–actually Pastor Rick’s local church. It was an influence because I saw my purpose in terms of my place in eternity. I really want to read Experiencing God–since you’ve recommended it. You are a huge inspiration to me, Tricia. Right now I’m reading a book you contributed to–31 Days of Prayer for the Dreamer and the Doer! I was also influenced by Stormie Omartians’s book, Stormie. I love how God worked in her life and all of her circumstances. empty. (living full of faith when life drains you dry) by Cherie Hill. It is helping me with understanding why God does what he does. I have read so many good books and want to read all of the ones on this list. Some of my favorites are Say Goodbye to Survival Mode by Crystal Paine and Hope for the Desperate Mom by Sarah Mae and Sally Clarkson. I’ve read several of these you’ve listed and would agree that they breathe life. Actually, the only one I haven’t read is Own Your Life. I need to remedy that because I love Sally Clarkson. The Friendships of Women by Dee Brestin, The Power of a Praying Wife by Stormie Omartian, Yes by Ann Kiemel Anderson, and The Shack by William P. Young. Circle Maker and Experiencing God have been pivotal in my walk and relationship with the Lord. I’m so thankful that God has brilliant authors that can bring across the true message of the Gospel. I don’t know if I can narrow it down to 6. There are so many, but these have had significant impact on me, for sure. It goes without saying the Bible is on the list. Also The Screwtape Letters and Mere Christianity by C.S. Lewis. Also The Singnificant Life by George Weaver. Great article, just what I wass looking for.